A few years ago, collectors suddenly rediscovered a small 1980s doll, causing prices to soar and resulting in several new ranges of, often, rather strange-looking dolls. At the centre of the furore was Blythe, a novelty doll produced by Kenner in 1972, and distributed in Britain by Palitoy. She was also marketed in Japan, but wasn’t successful there, either. The doll, designed for Kenner by toy designer Allison Katzman, was just under twelve inches tall, with a slender teen body and an overlarge head. She was obtainable in a choice of four hair colours – blonde, brunette, dark brown and auburn, with additional variations such as fringes or a centre parting. When Blythe was first issued she scared so many children – and their mums – that the doll was withdrawn after just one year. Normally, that would have been that, had not a lady called Gina Goran decided to try out her new camera, grabbing the first doll she could find to test out the lens. By chance, Gina happened to be one of the relatively few collectors of Blythe dolls at that time (late 1990s), and when she saw how great Blythe was as a model, she decided to dress the doll in unusual outfits and to photograph her in various place-settings. The resulting photos were gathered into a small book – and soon, prices for Blythe dolls had escalated. Suddenly, a doll you could once find for a couple of pounds at a boot sale was like gold dust. However, that’s not all – for there was an increasing interest in the Japanese ‘Anime’ art form; large eyed, large headed characters with over-emphasised features, and, as Blythe fitted the bill, she found herself in great demand, not only in America and Britain, but also in Japan. There, after being pasted on billboards across the country as part of an advertising campaign, she was adopted by companies such as Takara and Pullip, who produced dolls of a similar appearance. Blythe’s main claim to fame was that she could change the position and colour of her overlarge eyes. Yet this wasn’t an innovative development – Pedigree had done much the same thing almost thirty years previously when they manufactured Pretty Peepers in the late 1950s. This Pedigree girl, though, was 22 inches high, and her head was normal size, so she looked just like an ordinary doll, unlike the character appearance of Blythe. Presumably, Blythe needed the large head to incorporate the eye-change mechanism, which was operated by a pull cord running from the back of the head. Her eyes were large and round, and they changed from green to pink to amber to blue each time the string was pulled, momentarily closing between each pull. The blue and green eyes were side-glance, while amber and pink looked straight ahead, and apart from the ‘scary’ appearance – pink, especially, was unnerving – the cord was prone to breakage or jamming; another reason to make the doll unpopular in the 80s. Blythe was a trendy girl who favoured ethnic-type outfits, patterned kaftans and ponchos, all utilising plenty of braid and fringing. 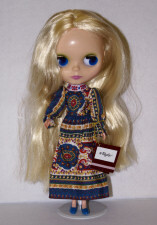 There were twelve outfits available, and she was originally sold wearing one of four maxi dresses; auburn, ‘Love ‘n’ Lace’ (green scattered with flowers), light brunette, ‘Golden Goddess’ (yellow, trimmed with braid), dark brunette, ‘Medieval Mood’ (brown with a Celtic pattern), and the blonde, ‘Pretty Paisley’ (blue paisley print). In addition, a range of carded outfits included ‘Lounging Lovely’, ‘Roaring Red’, ‘Kozy Kape’, ‘Aztec Arrival’, ‘Pleasant Peasant’ and ‘Pow-Wow Poncho’. ‘Priceless Parfait’ consisted of a boldly-patterned yellow, blue and pink skirt, pink top with matching bag, fringed scarf and scarlet boots, while ‘Pinafore Purple’ was a purple all-in-one with flared sleeves and a medallion-patterned skirt worn over the top. The reverse of the backing card depicted other items in the range. Usually a Blythe label was attached inside the garment, making identification easy today. An attractive ‘Blythe’s Fashion Wardrobe Case’ bearing a picture of Blythe, was available to store a doll and her outfits. Perhaps the most zany accessories were the wigs – huge frothy bubble-cut affairs in ‘Blueberry’ (blue), ‘Lemon’ (yellow),’Strawberry’ (pink) and ‘Lime’ (green), complete with a pair of trendy sunglasses. Each wig had its own polystyrene wig-stand, and a special combined brush and comb. Once Blythe was flaunting this movie-star get-up her appearance was amazingly altered – in fact, she resembled the poster for the musical ‘Hair’, which was still in vogue at the time. When Blythe ‘reinvented’ herself in the 2000s, fans clamoured for her, and soon Takara, a Japanese company working alongside Hasbro, brought out their own range, which have proved immensely popular, though annoyingly, very difficult to obtain in England. It is normally necessary to use the internet or mail order to obtain one. Takara Blythes have evolved to the extent that the plastic and colouring is almost identical to the original Kenner/Palitoy 1970s dolls, and they feature the four colour eye-change mechanism worked by a pull string. These Takara dolls are made from a mould based on a 3-D laser scan of a vintage Blythe. There is also a range of four-inch high mini Blythes. The Japanese people have taken the Takara Blythe to their hearts, dressing her in street-wise, kookie fashions, as well as replicas of the original Blythe outfit. The dolls have such names as Modrian, Dotty Dot, Hollywood, Disco Boogie, Dainty Biscuit and Nighflower and are sold in brightly coloured boxes with retro graphics reminiscent of the seventies. A few months ago, Mattel released a range of dolls based on the Blythe idea – and these are available in Britain. Beauty Cuties eye-change dolls with heads even larger than Blythe’s, and with very small bodies. By pressing the top of the head, the eyes change from side-glance brown, to forward blue, side-glance purple and side-glance green, though the colours and eye-pattern varies slightly between dolls. The Beauty Cuties come with a selection of cosmetics and hair extensions, and there are three hair colours – Rockabelle (blonde), Glamalina (brunette) and Lovelylu (auburn). 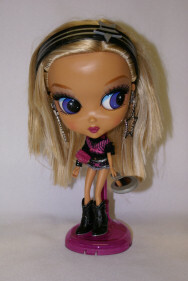 A couple of years ago, Ashton-Drake introduced a replica version of Blythe. She has appeared in several outfits, all very similar to the originals, and is perfect as an alternative to an original 1980s Blythe – and with these selling at £500 plus, nowadays, the Ashton-Drake doll is a welcome substitute. Of a similar idea to Blythe are the Pullip dolls produced by Jun Planning. These are a slighly more ‘grown-up’ version of Blythe, with a shaped body. The limbs are fully articulated, even the wrists and ankles are jointed. The eye action on a Pullip is not a colour-change, though, it is a side-glance and winking movement, controlled by levers at the back of the doll`s head. Many of the Pullip outfits are, to say the least, very unusual, and are great fun, especially those on dolls such as the space girls, Mercury and Jupiter. These have pastel coloured hair and are clothed in silver. For drama, you can’t beat Cornice, a black dressed Goth with flaming scarlet curls, while Chicca’s stripy outfit is dazzling. The costumes and accessories on these dolls are amazing, with zips, toggles and buckles which really work. Other Pullip dolls include Noir, Withered, Arietta, Bouquet, Chicca, Principessa, Blache, Stica, Squall and Venus. Additionally, there are storybook versions – Red Riding Hood, Alice In Wonderland and Ann of Green Gables, and several boy dolls, just as wacky as the girls! As with the Takara Blythes, mini Pullips are also made. 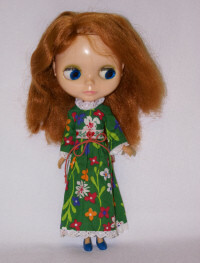 Another Blythe look-a-like was the Toy Depot range of Designer Girl dolls, which were introduced in 2001. These dolls boasted similar eye-movements to Blythe, and were quite similar, though the mouths were thicker, necks thinner and the plastic was more shiny. They came in four hair colours, blonde, cerise, black and purple, but they were shunned by Blythe enthusiasts as ‘cheap copies’. Copies they may have been, but at £10 for a Blythe look-a-like, they were a good buy, and are certainly one to watch as a future investment. In fact, with a bit of customising they could be made into attractive Blythe clones. The Blythe influence was noted by manufacturers of play dolls, and soon the big-eyed, large-head syndrome was appearing in many dolls, most notably Diva Starz, My Scene, PowerPuff and – of course – the biggest phenomenon in the doll world for many years, Bratz, by Vivid Imaginations. Their eyes might not be quite as large as Blythe’s, and they don’t have a pull-cord to change the colour and expression – but that in-yer-face, street-wise attitude is surely how Blythe would have looked had she been thought of thirty years later. Kenner and Palitoy Blythe dolls now sell for around £500 on the internet, double if they are mint and boxed. Recently, a mint (but unboxed) blonde Kenner Blythe sold for £1,067 and an auburn for £1,258. Even broken ones, or heads alone, can reach hundreds of pounds. Auction houses such as Vectis include Blythe in their sales nowadays – she is the perfect answer for those who say that doll collecting never pays. It does, if you are astute enough to spot the crazes before they happen! Once, no-one wanted the large-eyed, big-headed girl, but today she is hot property. Everyday she gains new devotees and attracts clones and dopplegangers. Though maybe not as beautiful as a more traditional doll, Blythe and her lookalikes encapsulate the modern anime/street culture, and make a fascinating addition to any doll collection. Blythe was just born thirty years too soon!